The biggest change in the construction industry heading into the year 2016 is the projected exponential growth, with total construction spending expected to reach 9.7%. Increasing development in educational and healthcare facilities, and nonresidential spaces as a whole, are driving a nearly 40% spike in industry growth from the past three years. In general, the construction industry is looking positive in terms of growth in almost all areas, but there are a few areas that will be focused on in the next two to three years, including the need for more trained workers. What Are the Sectors with the Most Growth? Nonresidential construction is looking up in 2016; Growth in the manufacturing sector is expected to increase by 17%, and following closely behind is Commercial with a 13% projected increase in growth. From roads to bridges to unseen water pipes, these necessities of civil life are now extending past their design life and are starting to fail at a greater rate. The demand for infrastructure will be continuing to grow throughout the year and into 2018. And if you want to know where to go to see the action, according to an article on Forbes, Dallas, TX is one of the top cities with the most new construction heading into 2016. Dallas welcomed $17.8 billion in new projects at the beginning of 2015, 19% more than 2014 and a little over $1 billion more than Houston. Dallas followed New York City closely behind as #2 on Forbes’ list of the top 20 cities where the most money was spent on new construction in 2015. How Will This Affect the Construction Industry? Construction jobs have seen major growth as well, with new employment increasing to 800,000 positions within the three-year period from 2014. And construction spending is supposed to outgrow all previous periods, starting out the year at 20%, and averaging at nearly 10%. 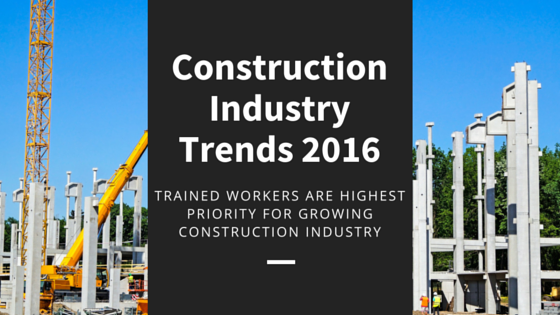 What this means for the construction industry is a demand for more properly trained employees. In fact, one of the top ten trends we will see this year in the construction industry is a shortage of skilled workers with adequate training. At the time of the economic crash in 2008, many skilled laborers left their jobs or were laid off and never returned to the industry. In Texas in 2014, nearly 90% of construction firms could not find enough qualified workers. 41% of the Texas construction industry did not believe the shortage of workers to improve going into 2015, and 36% thought the problem would only get worse in the coming years. What Can Workers Do to Get Training? Workers need to seek out high-quality, OSHA compliant training to qualify for jobs in 2016. The construction industry is alive and well and employees can take advantage of a wide variety of jobs since the economic crash in 2008. But cities like Dallas won’t be properly serviced without qualified workers. CertifyMeOnline.net is an online training platform that is affordable, and takes only about one hour to complete. They will train workers in Dallas in OSHA regulations and will help to reduce the number of fatalities in the construction industry, and provide a more efficient workforce. This entry was posted in Aerial Lift Certification, OSHA News on February 16, 2016 by admin. How Many Miles Does an Average Forklift Travel in a Year? © 2018 CertifyMeOnline.net. All Rights Reserved.